Many of those who attend our certification seminars are surprised to find we reserve a segment of the seminar to discuss and demonstrate the ATM2. Others are surprised we don’t spend much more time given the importance we tend to impute on it as a co-treatment to decompression-traction. The primary reason I discuss it and will demonstrate it on several attendees is simply due to my great faith in it as a viable and demonstrably effective modality. Active-interventions & exercise can NEVER be discounted in a clinical encounter. In acute pain conditions exercise per se is generally avoided….however in many “acute” conditions the ATM2 IS the treatment of choice. This is even more so in chronic cases and confusing diagnostic profiles where movement disorders scuttle clear indications to or benefits with adjusting. Additionally every clinician needs active–interventions that supplement passive ones…and the ATM is without equal. I recognized the advantages to having an ATM2 and the large number of patients having disordered–movement patterns attendant with compression that thrive with it as part of the program. The manufacturer of the ATM2 offers the complete education that most new owners will require to really get-with-the-program. Our seminar discussion is rudimentary and meant as an introduction. We recognize many are focused entirely on their decompression education and don’t want to be side–tracked! If however you are interested in more detailed instruction from us while attending a Kdt seminar we’ll be happy to give you additional one-on-one instruction. Very few of us need a tutorial on using a drop-piece for pelvic-rotation adjusting. The Neural-flex incorporated a crisp, effective drop-piece into its normal articulating segments last year. The premise was to afford the doctor the ability to adjust relevant PI/AS pelvic rotations (pre or post NOT during the pull) decompression to reduce time and improve office flow. Adjusting is what most patients anticipate Chiropractors will do…though many sessions of course may not include it for a number of reasons. However addressing the pelvis (leg asymmetries/bony landmarks & palpatory findings) via a drop-adjustment affords one more plug-in to captivating and “controlling” the patient. IF an adjustment Pre-or-post decompression (based on chronicity of condition) is given importance in the ROF and continues through the treatment the patient is more likely to recognize your intervention as unique and well-directed to their condition. 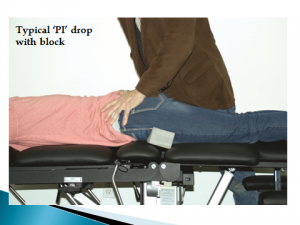 Creating a compelling clinical sequence regarding the decompression, modalities and drop-pelvic adjustment is one more way of improving retention and addressing the patient’s condition more accurately. A Simple way to protect your NF table from dirty shoes….. This is a pet-food tray made of firm but flexible ABS plastic (1/16″ thick). It’s available in Walmats’ pet dept. for under $5.00. It’s easy to store under the table and won’t damage the Naugahyde. If you or your staff simply prefer not to have every patient remove their shoes (or forget) and fabric-covers seem ineffective and difficult to clean, this may be worth a $5.00 investment. 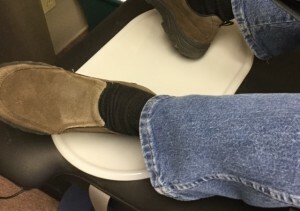 Additionally we find some patients get the heel of there shoe into the face-opening…the tray eliminates that as well.